Mexico is an important country. It is not only the neighbor of the USA, it is a large and populous nation with a political history that has had an impact on the whole of Latin America. Just as the Right was cheering the receding of the “Pink Tide” that had swept Latin America, and the jailing of its iconic figure ex-President Lula of Brazil, comes the revival of the democratic, populist left in one of the most significant countries of Latin America. A few days ago, a veteran left populist leader Lopez Obrador swept the presidential election in Mexico in what was reported in the world’s media as a “populist landslide”. Lopez Obrador is a veteran politician which is an important point to note in a global and Lankan context in which rightwing nationalist populism denounces politicians and celebrates being outside the democratic system. Lopez Obrador was Mayor of Mexico City before he made his first run for the Presidency in 2006 and was deprived of victory by electronic rigging. He is thus a highly experienced politician at both municipal and national levels. The term ‘Populism’ was coined primarily in relation to Latin America. The paradigmatic populist was Juan Peron of Argentina. But there is populism and there is populism. There is a populism of the Left, the Center and the Right. Lopez Obrador is not a doctrinaire leftist. He is a left populist. He emphasizes the state sector, the social community, and the small peasantry—unlike the populists of the Radical Right from the US to Sri Lanka who emphasize none of these and instead fetishize the nation, religion, language and technological fixes. Left populism stresses what unites the people, such as social justice and material welfare. New right populism stresses what divides people, such as race, religion and ethnocentric culture and tradition. Left populism looks forward. It is therefore classified correctly as progressive. Right populism looks backward at some glorious age. It is restorationist and reactionary. The victory of Lopez Obrador also brings out the issue of nationalism. Lopez Obrador is a nationalist but not in the sense that President Trump is a nationalist. Left Populism doesn’t try to instill fear and anger. It is not a narrow nationalism, emphasizing race and religion. Left populism is nationalist but not nativist. It is a progressive nationalism, not an exclusivist or hegemonistic one. Left Populism is a nationalism that unites from below. In the nationalism /populism mix, left populism is more populist than nationalist while Right populism is more nationalist than populist. Lopez Obrador’s slogan was “DEEP CHANGE WITHOUT DICTATORSHIP”. This slogan sums up the difference between Left populism and right populism. Left populism strives for deep-going change; change that immediately benefits the people at the grassroots; people in the communities in which they live. It is change from below. Right populism or rather Rightwing nationalism wants top-down change which empowers big business, technocrats, managers and the military along one axis and races, ethnicities and religious groups on the other axis. Left Populism believes in the people especially at the community level, and the state. Right populism believes in market forces and big business. Left Populism’s notion of “deep change” also stands squarely against “dictatorship”. It does not believe in change through dictatorship. It does not agree that dictatorship is necessary for or justified by change. Left populism understands that any kind of change that requires or results in dictatorship is the wrong kind of change; change that will only benefit the few, not the many. Rightwing nationalist populism loves authoritarianism, even military rule and totalitarianism. Left Populism is rooted in democracy; it just extends and expands democracy and human rights from the political to the social, from the individual to the collective, without infringing upon political democracy and human rights. All populism has a streak of nationalism but not all nationalism is populist. Furthermore, not all types of nationalism are alike. There is progressive nationalism and there is reactionary nationalism. The progressive nationalism of Left Populists such as Lopez Obrador, is an anti-imperialist nationalism which solidarizes with the oppressed of the whole world, especially Palestine. Rightwing nationalism or Right Populist nationalism is narrowly sectarian. Mexico is not the only country or place in which Left Populism has shown the way. In a society quite different from Mexico, namely the United Kingdom, Jeremy Corbyn’s Labour Party almost won the last election and is tipped to win the next one, running on a manifesto with the thematic slogan “For the Many, not the Few!” (That phrase is an adaptation from the concluding line of a poem by Shelley, ‘The Masque of Anarchy’.) Corbyn emphasizes the need for social justice and equitable growth, enhanced social welfare such as housing and health, more scholarships for students, improved public services and the recovery by the public sector of some areas which had been privatized. From the USA itself comes the next example of the electoral rise of Left Populism. A mediagenic 28 year old woman, Hispanic, an alumni of Boston University and part-time waitress, Alexandria Ocasio-Cortez, won the New York Democratic primary beating a Rightwing Democrat. She describes herself as a Democratic Socialist and recently condemned as a “massacre” the Israeli shooting of hundreds of unarmed Gaza demonstrators. What are the lessons for Sri Lanka? Firstly, there is a global populist wave sweeping away neoliberal democracy, and that is operating in Sri Lanka too. It will successfully peak in 2019-2020. Secondly, the Populist wave has two antithetical, antipodal expressions. One is a rightwing nationalist populism, also known as the New Right or the Radical Right. President Trump is its best known exemplifier. The alternative types of Populism are Left Populism and Centrist Populism. Lopez Obrador and Jeremy Corbyn represent the former while Emmanuel Macron represents the latter. Thirdly, there are also two ways of defeating neoliberal democracy. One is by defeating economic neoliberalism while retaining and strengthening democracy—which is the Left Populist and Centrist Populist way. The other is to throw the baby out with the bathwater, which is to depose both neoliberalism and democracy, enthroning Right authoritarianism, a civilian-military hybrid rule, military rule or outright fascism. Fourthly, the very worst option is to combine the worst of both worlds, i.e. retaining some aspects of economic neoliberalism while truncating democracy and installing a harsh, rigid rule. We in Sri Lanka face these choices, these sets of existential choices. We stand at a crossroads. If we make the wrong choice, Sri Lanka with its democratic and social welfarist heritage, its multi ethnic distribution and its proximity to a giant neighbor which contains the ethnic kin-state of our Northern minority, will enter a cycle of conflict which will end in partition. If on the other hand, we make the correct choice, we can have a conflict free transition to a better future. Do we have an equivalent of Lopez Obrador? I believe so. It is a collective, but also an individual. Mahinda Rajapaksa would most certainly be the closest equivalent but he cannot run for the Presidency. MR, Dinesh and Vasu make up a collective Lopez Obrador. But I do not wish to dodge the crucial issue of the candidacy. Given his leftist past from his student days at Richmond College Galle, his long political career as a progressive populist, and his diplomatic demeanor and calm, consensus-building style as Speaker of the Parliament, Chamal Rajapaksa would be our closest equivalent of Lopez Obrador as a presidential candidate. 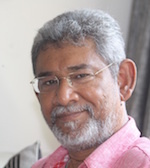 This is perhaps why Sri Lanka’s equivalent of Jeremy Corbyn, namely Vasudeva Nanayakkara is urging the choice of Chamal as the JO candidate for the 2019 presidential election. I cannot but agree with him. It is not fair to change the “gotta” so frequently. DIGNITY MY FOOT! What happened to Chamal Raja’s duty-free car permit? He sold it. Pocketed Rs. 33 million. Stealing from impoverished Sri Lankan Taxpayers. CHAMAL RAJA IS A THIEF! He promotes nepotism like no other. Watched with no tears shed while his siblings, kith, kin, their cronies, and henchmen robbed this nation for a decade. His son kept stolen elephants from Sri Lanka’s national parks. CHAMAL RAJA IS NO BETTER. Get your head examined Dayan! 21 million Sri Lankan citizens. You keep going back to an uneducated, criminal clan in Hambantota to find candidates to govern SL. And he will see no evil, hear no evil, speak no evil and let his clan raid and plunder the island’s treasury, kill and maim innocent people, ban media reporting all such evil behaviours, keep a dignified silence on all front, and hope fully fill all vacant diplomatic postings. Any man who can face Lanka’s past history without fear ……….. and doesn’t have a crystal ball or Sumanadasa for an uncle ………….. can only predict one thing with utmost certainty ……….. It doesn’t matter whoever comes ………. we are going down the tubes ……. there’s only one direction for Lanka and that’s down …………. only light at the end of the tunnel is that we may go so down we might be able to rescue those Thai boys trapped in the caves ……….. If you guys wanna wish, then wish …….. if you wanna hope then hope ………. they say living in hope is what kills us all in the end. To hell with Gota, Mahinda, Sirisena, Ranil, Chamal …………. I’d rather have Bruno Mars as the president ………. that guy has at least some talent ……… sing in tune and dance in step ……. value for money! This troll Dayan is a GATE KEEPER to the Rajapakse clan and the Rajapakses belonging to the GOVIGAMA MAFIA RULING ELITE force. The method of Dayan is very obvious as he keep on repeating the same mantra of lies a million times until it will be accepted by the gullible as the truth. His mantra in the Propaganda War waged for any RAJAPAKSE to become the next head of state is an undying feature. The selection of GOTA the GOTLER has been finalized by US/ISRAEL/INDIA-The Evil Axis programmed for the destruction of Pakistan and Iran in their pre-planned PIVOT of ASIA War efforts. The present discussion released to fester and roam in the public domain is to check the pulse of the mood of the people if its acceptable to them. As Dayan’s role is to keep one side of the divide of the population(Mahinda and the Sinhala Racist camp), defending this EVIL decision of the ruling cabal (Govigama Mafiosi), while the side of the Govigama (UNP) lends its support by doing nothing to stop this EPIC criminality from happening. All of them are on the same goal of working for the benefit of the International Zionist system that work from the West. The ordinary folks in the country DO NOT HAVE the power to do anything to prevent this impending CRIME against the HUMANITY from happening in real time. Hey Dayan, “your choice” Chamal has already got a back seat. Gotabhaya is neither an option nor a choice. He is A CHANCE. He will jump and take the chance as he has nothing to lose. But others have lot to lose when he loses. If you want have one foot in the yahapalanaya camp and the other foot in the Rajapaksa camp, that’s fine – feel free to do it. But don’t bring in silly, embarrassing comparisons like Vasudeva Nanayakkara, a sell-out ex-Leftist, is our Jeremy Corbyne and Chamal, Mahinda, Vasu and Dinesh together or separately are our Lopez Obrador. What you are writing these days is so nauseating and embarrassing. This is what happens when you are sitting in the departure lounge with no where to go! Did you drop Gota already? He is sticking with the Rajapakse clan. Even the clan is dilly dallying between the two brothers. The JVP musr be lurking and licking their lips, thinking of Obrador of Mexico and Alexandria of New York.!! But this nation will never forget the 1971 killing spree and the terror of 1987. Dayan why do you only look for a President from the Rajapakse clan. Lopez Obrador the country’s first leftist candidate defeated the ruling PRI and conservative PAN who have governed the country for over a century. The burning issues were corruption together with law and order. Old Royal family is the $18B thieves. Thero chaff is calling somebody worse than JR as Lopez Obrador. This is how Thero monkey praises all other monkeys’ tail to get a beggar job to have his wine supply uninterrupted. That Brother Prince is an extreme radical right. (All Old Royals are extreme right dictators, but they hire Thero like subservient to advertise them as “Smart Patriotic, Social Democrats” . They all know Thero is fruitless talker and talk for any angle, anytime, without self-respect. That radically right Brother Prince has good taste for extra fine luxury things. He likes places like homes, obedient servants& high class wine like Thero. Thero pick up all rotten rascals and describe them as the highest in the world with his word magic. So Dayan you have a smorgasbord of prospective candidates across an ideological spectrum that you yourself draw up to suit your changing fortunes. You pick and choose whoever turns out be beneficial to your own interests. You baptize these jokers as left, right and centre to suit your own desperate needs. And you call that political analysis. Now, Vasudeva Nanayakkara is our equivalent of Jeremy Corbyn? What a f+cking joke. 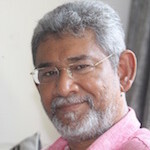 Vasu who started his politics in N.M’s LSSP advocating revolution and language parity and so on has now descended to the level of a run-of-the-mill petty politician desperately clinging to his parliamentary seat by flapping Mahinda’s racist Amude. He is not even the equivalent of Jeremy Corbyn’s next door dog’s a++hole. Dayan you must stop insulting people. Don’t think political science is some goddamn esoteric stuff that is above ordinary peoples’ head that you can bamboozle them by your fancy jargon. You pose as a pundit but actually you’re a jockey. Because Lopez Obrador won in Mexico, the bland Chamal Rajapaksa has suddenly turned into our own hispanic progresivo? As usual you don’t fail to indulge in some name-dropping. So now we know Stanley de Zoysa’s 82 year old daughter is one of your numerous international celebrity friends. Good for you. Now what happened with your promotion of the wannabe Sri Lankan Hitler? Are you embarrassed that Gotabhaya’s economic agenda has turned out to be even more to the right than UNP’s neoliberalism? So much so that you can’t spin him anymore as a “left-of-centre nationalist” ? Gota is going to go all the way, integrating our economy even more closely with global capitalism, accepting IMF diktats more readily, and implementing the corporate agenda of tax cuts to the wealthy and reduction of social services. Needless to say there won’t be any strikes, student demonstrations, street protests or free-media. So Dayan – you the former Marxist revolutionary – will you be still jockeying for Gota if he becomes the Rajapaksa candidate instead of Chamal? Despite all your theoretical mumbo jumbo you’re so transparent, and that’s the only good thing about you. Two people are having a chat at a Buddhist Temple in LA, USA; and from that conversation one declares how dignified the other is. An ex-diplomat and Oxonian intellectual hearing above declares the afore mentioned dignified individual is the rightful candidate for the Sri Lankan presidency. Whoa! How populist is that, how humble, how down to earth oh how so at the roots of the grasses. Dr. DJ sometimes you lose me completely and profoundly! Do ignore Vasu, he means well but is a bit off the charts most of the time. You do know that Dr. DJ has this slight tendency to drop names at random. Be grateful that he didn’t mention Gramsci this time. You usually agree with the name dropping public racist’s all the positions all the time. Why sudden change of heart? No you are correct left take easy solution simply make them disappear. So where is this utopia Dayan. Ah! right Rajapaksa era. What prompt you to dislodge from Gota? Is it because anti-GR crap that regularly appear in CT? Chamal is too soft to run SL Dayan. We’re a backward nation and need a straight guy to put it back to the right track. Its none other than GR. From the available lot, only GR has the capability to lead the country and usher a better tomorrow. Let LTTE sympathisers, drug dealers, anti Sinhala Buddhist spin docs etc., be upset and shivering for him, law abide majority patriotic society wish an GR era in 2020. Forget the public racist Dayan who takes 64 positions all at the same time. He doesn’t mean what he types and he doesn’t types what he means. You should often visit us in this forum and make us feel as if our lives are worth living. However, you are very quiet since the sentencing of the saffron clad thug. Where were you living during the seven days he was in the prison? Now he is back have you relocated to his Amude? So, now you agree the that Mahinda & Gota do not fall into the category of Left populism in Srilanka. You compare Vasudeva to Corbyn but still propose the Presidency should only come from Mhinda Family. Why cannot Vasudeva or Dr Dayan Jeyatilake to be considered for presidency? Which one is more important to the country? Populism with narrow nationalism emphasizing race and religion (Mahinda & Gota ) or Vasudewa or Dayan who are popular who are left, popular, no corruption, no violence can win minority votes. Why Chamal? Will you answer my questions? Mexico is ruled by mafia drug cartels, local Hitlers, private armies. Unemployment is very high. Corruption rules the Police, judiciary. Mexico has retained elections because the results are easily manipulated. Peace loving Mexicans yearn to lead a violence free life. Recently Mexicans elected Lopez Obrador as the President. Lopez Obrador will soon find out that and the governing structure, made of corruption bricks, is impregnable. Does this brief remind you of our very own Lanka? The Dayan Jayatilleka ilk call Lopez Obrador a ‘populist’. Dayan Jayatilleka harangues about Mexico electing Lopez Obrado as President. Dayan poses the question, “What are the lessons for Sri Lanka?” The answer is “NOTHING”. If at all Mexico may learn from Sri Lanka. Dayan Jayatilleka cannot stand on his own – he has to latch on to someone. He latched on to MR-team collectively and individually – the latest is Chamal. He says, “Chamal is the Lankan Lopez”. Watch this space – He is gona say that Namal is the Lankan Jeremy Corbyn! Ayoo….sin men…..you have already dumped poor Gotler?? This “Dr” ? DJ is going nuts on hearing the objections filed against his “Cut Deal” to be an “Ambassador”. In another comment above “Ben Hurling” has given a “needle head” open look at the suggested person of “DJ” to be a “Presidential Nominee”. How did this “Chamal R” made his son the “Chief Minister” a “Director of Sri Lankan Airline” and the “Basnayaka Nilema” of Katharagama. How and Who did by “Special Gazette Notice” exempt that “Basnayaka Nileme” being answerable to Public Trustee and all other Government agencies? How did this “Presidential Nominee of DJ” conduct a “Delegation” carrying “Buddha’s Relicts” to Japan on the “Advice” and “Directions” of a “Buddhist Monk” who has been “Black Listed” to enter Japan. Hasn’t DJ forgotten how and why that “Buddhist Monk” was refused entry and immediately deported from Japan on arrival with this “Chamal R”? Has DJ also forgotten how this “Chamal R” managed with the “direct” involvement of his wife in “offer of jobs”(chits marked with Bank A/C numbers) to the Colombo Port when he was the Minister in-charge? Has DJ overlooked the statement of “Basil R” viz. “I will run the country, when GR becomes the President”. Doesn’t that include DJ’s nominee, this “Chamal R”. It will once gain be a “MR & Co. Inc.” Dr. DJ: Please keep off “Nominating” Presidential Candidates from Rajapakse family. We know, you are playing “Dirty Politics” to achieve your personal “Agenda”. Haven’t you come of age to be little more honorable to achieve those goals? Chamal as left populist Presidential candidate for Sri Lanka? You are joking Dayan! After all these years in parliament, which left oriented policy did he initiate or support? What are his political ideas? Did he condone human rights violations during his brother’s time? Did he NOT support crony capitalism when he and his brothers had power? Did he condone nepotism or went along with it? Do we need a Rajapakse dynasty to rule the country again? What happened to the Weerawila Farm(over 500 hectares) which was government owned before but now in whose hands? Chamal: never heard of him. Isn’t he old? But is he is a leftist populist and emphasizes the state sector, the social community, and the small peasantry, then that’s the ideal for Sri Lanka. Obrador is of course the result of Trump policies – America to remain right-wing populist, and surrounded by countries of left populism. Good global balancer. The whole world can’t be a market-place. Dayan ,You are getting stale by the day mate. People are aware of Chamal’s card . All these diversions and taking the mass on a whole sake ride is over. Everyone is aware of the internal deals . In today’s Sri Lanka politics there are no lone wolf . They are all a happy family one pack . President in 2020 will be My3 and PM will be Mahinda and he will have his same old lot with him again and will have a majority again. Yes I agree because of Ranil’s unwillingness to give the deserving young men and Sarath Fobseka the due positions The UNP will loose very badly . Anybody who thinks Namal Rajapaksa has “dignity, maturity and modesty ” has serious problems. Namal Rajapaksa is a rowdy, ill-behaved thug. His father and uncles being rogues and murderers who were and still are sponsoring criminal gangs does not make Namal Rajapaksha into a rougue or a murderer though. But for decency’s sake please understand that you cannot pass off a rowdy spoilt brat like Namal Rajapaksha as an equivalent to López Obrador, who is in fact the antithesis of what Namal Rajapaksha and most of the Rajapaksha clan represent. Also, López Obrador’s whole movement is about stopping people like Namal Rajapaksa robbing his country and if we are to find someone even closely equivalent to Obrador in Sri Lanka then we have to look outside of the established politician gangs. We are not even at the start of such a movement, and a deeply fractured and polarized society like ours will first have to find ways to unite before we can take care of vultures like the Rajapakshas.